To leverage this widely available village-level resource, World Health Partners (WHP) combines an effective commercial sector approach – franchising – to empower and motivate these existing private health workers to deliver higher quality care to their patients. We use low-cost communication technologies and remote diagnostics to turn these providers into lifesaving connectors between the high-quality care available in India’s urban areas and the 70 percent still residing in rural communities where no care is available. To join WHP’s social franchise network, branded “Sky,” providers must pay up to $2,000 – these fees cover the cost of telemedicine-related technologies and updating their clinics to meet WHP-set quality standards. This level of investment means these providers now have “skin” in the game. And membership also brings benefits: a link to our qualified doctors in Delhi via telemedicine; access to WHP’s last-mile supply chain stocked with our own branded generic medicines (SkyMeds) to ensure immediate availability of affordable, high-quality drugs for the patient; as well as training, marketing and branding support. 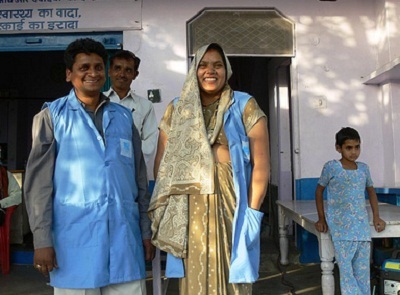 (Left: TheSkyHealth Clinic in Uttar Pradesh, India). In exchange for these benefits, WHP requires all members meet certain quality standards. We also mandate provision of preventive services, such as family planning and antenatal care. These services are simply not lucrative enough from the business perspective, yet critical to affect positive health outcomes in the long term. All services are fee-based. Providers pay for membership and patients pay for products and services at a fee determined by our providers. Providers also earn profits on the medicines they sell. These same network providers service the very poor (those living below the poverty line) with help from donor and government subsidies. All of this is done at scale, with a focus on sustainability. Reaching large numbers of poor, underserved communities is our highest priority. It is through high volume, wide range and critical mass that we are able to reduce the cost to our clients. To date, WHP operates in two North Indian states with more than 5,000 Sky providers serving a population of more than 25 million, and will soon replicate the model in East Africa. Ultimately, organizations like WHP shouldn’t exist. But while governments work on strengthening public health care systems, a market-based approach in regions where the private sector already provides the majority of care makes for an effective supplement to the public sector. This approach allows us to bring care to the people who need it most, now. Jacqueline Kingfield is a project manager in the U.S.-based World Health Partners team where her work focuses on strategic management and operations. Editor’s note: This article was originally published by World Health Partners and Business Fights Poverty and is cross posted with permission. (i) Planning Commission. Government of India. via bbc.com http://www.bbc.co.uk/news/world-asia-india-17455646. (v) Presented to Indian Parliament by the Ministry of Health. (vi) Estimated by Dr. Jon Rohde, former head of UNICEF in India. (viii) NSS (2004-05). Ministry of Statistics and Programme Implementation. Government of India. http://mospi.nic.in.